90k Route: Galway-Moycullen-Oughterard-Maam-Recess-Clifden-Cleggan-Inishbofin (ferry crossing from Cleggan to Inishbofin). 45k Route: Cycling group regroup at Maam Cross, where cyclists participating in the shorter route will join the group. Maam-Recess-Clifden-Cleggan-Inishbofin (ferry crossing from Cleggan to Inishbofin). This event is open to cyclist of all levels and promises to be both challenging and fun filled with the option of an overnight stay on the island of Inishbofin. 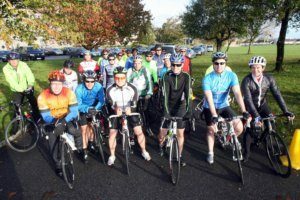 This cycle is in support of local charity “Voices for Down Syndrome Galway”.(www.downsyndromegalway.ie). Since its inaugural in 2013, €100k has been raised, a staggering achievement for all involved. Following the success of the last years it is hoped to raise much needed funs for the organisation again this year. There will be NO registration on the day of the cycle, all cyclists must register online to participate in the event. Following the success of previous Bike-2-Bofin and the high level of interest in this year’s event, early registration is advisable. Event is capped at 150 participants, so register early to avoid disappointment.